We all have our dream cities to live in. 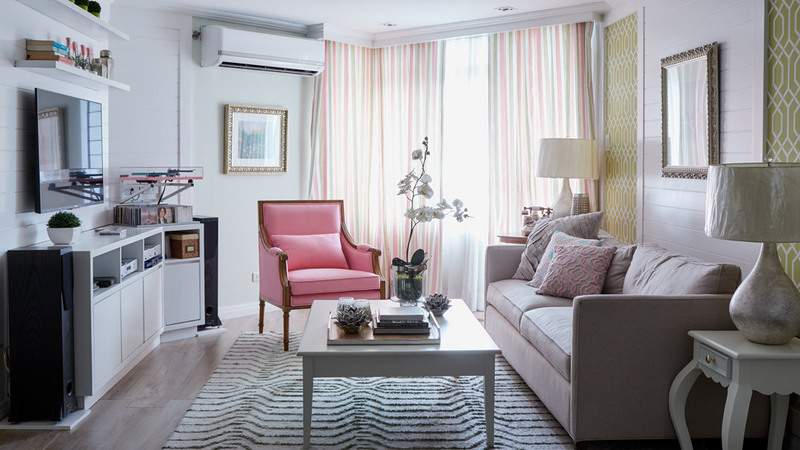 While others prefer the hustle-and-bustle of New York or the distinct charm of London, there are some who are in love with the idyllic vibe of Paris, just like the owner of this 146 sqm condo unit. “The only country I knew in Europe was France,” she shares. After visiting the lovely city many times and falling in love with it even more, the next step was to live in a space that will remind her of its beauty and vibe each time she wakes up. She looked for a bigger unit and found the perfect one with a view of a golf course. Since she’s determined to make her dream home a reality, she followed Real Living on Facebook and saved the photos that tickled her fancy. To her delight, most of the pegs she saved are projects by interior designer Van Acuna-Solana. The two met and the project flowed smoothly from there. “Ang galing nga, eh. Sinabi ko lang ang gusto ko. After two weeks, sabi nya, ‘Ipapadala ko ang perspective.’ Ang galing, wala masyado tinanong pero nakuha na niya yung gusto ko,” the owner explains. For her part, Van shares that it helped that she recently completed a project which is similar to the owner’s ideas. “It was easy for me because I already had an idea of what she wants. Her pegs are also my forte in design,” the designer says. Once the project was completed, the owner now prefers staying home all day. “Pag weekend, mas nagagamit ko ito pang-relax. Ngayon, dahil maganda na ang bahay, mas di na ako naglalakwatsa,” she quips.